I love Christmas. What’s not to like? It’s a magical time of the year with presents, good food, holidays, time with family and friends, along with great weather to match. And it’s just around the corner! It can be a wonderful time, but unfortunately it can be an unhappy, stressful and even lonely time for some. 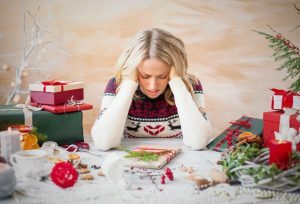 Emotions can run high, so for my first blog I thought it would be timely to give a few tips on how you can reduce the stress around Christmas. Where Does All This Stress Come From? Of course many factors contribute to stress, but in my opinion for many people the biggest stress comes from that feeling of having “too many things to do and not enough time to do them in”. And further stress often comes from financial pressure. It can become an expensive time of year if you let it! With a little bit of planning ahead it is possible to reduce these stressors. Let’s start with time pressures. Many of us don’t give Christmas a second thought until December. I blame the calendar for this! In my opinion where the 11th month is listed as “November” it should in fact be “It’s nearly Christmas, time to get planning”. Think about it, by early December there are only three weeks until the big day. And If you work, that eliminates quite a few of the remaining days for starters! Now think about all the things to be done. There’s all those presents to buy of course, and getting all the food and other goodies ready for Christmas Day. Then there are all those social events to attend: parties, friends to catch up with, and not forgetting the children’s end of year performances for school and extra-curricular activities. In my professional AND personal experience, by far the most effective way to deal with time pressure is time management. And the time to start is today, right now! Using a diary or calendar on your phone is a very useful tool for doing this. Start by blocking out the times for all the social engagements, like parties and performances. Don’t forget to include some times to prepare for those events, such as food preparation or getting costumes ready. This also enables you to identify any double bookings early and gives you the time to make alternative arrangements for them. Then block out times for your Christmas shopping. Remember that the later you leave it, the more crowded the shops will be and the longer you will need to allow. It can be helpful to block out some additional times, to allow for the unexpected. After all, things don’t always go to plan! Some Delegation Can Help Too! Another effective time management strategy is delegation. Every family seems to have one person who does more than their fair share of Christmas organising each year. Are you that person? If so don’t be afraid to delegate tasks to others, even the children. (Age appropriate tasks of course). Even a couple of jobs less can significantly reduce your stress, and has the added bonus of giving others a sense of contribution. Finances are often an additional source of stress at this time of year. Again, now is the time to act. Start by reviewing your bank statements and credit cards, to get an accurate idea of your current financial position. It can also be very helpful to complete your own budget for the upcoming months. These enable you to estimate of how much you will earn and spend each week, including the usual monthly and quarterly bills. Don’t forget to make allowances for holiday costs, and for unexpected expenses such as car or house repairs. Various websites, such as www.moneysmart.gov.au have free printable budget planners and online tools to assist. Completing a budget in this way can help give you a realistic idea of how much you have to spend on Christmas gifts and celebrations. It is also helpful to avoid making credit purchases, where possible, unless you have the ability to make payments as soon as they are due. Of course it is tempting to live beyond your means in the lead up to the festive season. But if you think about it, what’s the point of overspending if it’s going to cause you to worry, stress out, and take away all the pleasure of Christmas! Hopefully these tips will help reduce your stress levels in the lead up to Christmas. Of course, it is impossible to eliminate all stress. In the next blog I will give you some tips to help manage your emotions and reduce the risk of saying or doing anything this Christmas that you’ll later regret. Copyright © 2016 TG Psychology. All Rights Reserved.